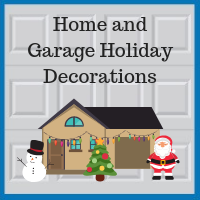 If your home’s front door and garage both face the street, your holiday decorating plan will be greatly enhanced if you decorate around your garage and driveway, as well as around your front door and walkway. You certainly have no shortage of options to fill up your outdoor space. As you have surely seen in home improvement stores, today’s outdoor holiday decorating options go way beyond the traditional strings of lights and plastic Santas. Oversized ornaments or snowflakes you can hang or place around the yard. Pre-lit faux birch trees in a range of sizes, creating temporary landscaping in a yard that lacks mature trees. Light projectors that project an image of falling snow across the entire front of your home and garage, or even a picture of your family Christmas card photo. Image projections are an easy way to dress up a plain, light-colored garage door. Solar-powered outdoor light strings that automatically turn on at sunset and stay on for about 8 hours. One of the most common mistakes you will want to avoid, however, is buying random items that do not add up to a cohesive and aesthetically pleasing design. For example, you have probably seen a “geographically incongruous” yard which contains both a Santa (North Pole) and a nativity scene (Middle East). Throw in some penguins (South Pole) and an inflatable Grinch, and you are more likely to win the Chevy Chase/Christmas Vacation booby prize than the Best Decorated House in Town award. Color focus: Keep most of your decorations in one color, such as white or a warm golden tone, and accent with one other color, such as red or blue. Santa’s workshop: Include figures of Santa, his sleigh, wrapped packages, elves, snowmen, and Rudolph and friends. Animals: Place lighted animals in strategic spots around your yard. Deer remain the most popular, followed by polar bears, but dogs and even a tinsel Christmas llama are also available. Luminaries: Line the driveway and front walk with luminaries or lanterns. These can be a great way to call attention to a beautiful custom garage with stone facing and a wooden door. “Modern farmhouse” is a popular style this year, using rustic materials such as mason jars, wood rounds, logs, or tin buckets as the base and accenting with natural materials such as evergreens, red berries, and pine cones. 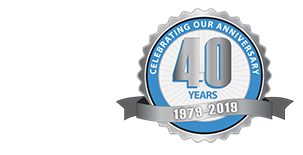 Blue Sky Builders of Downers Grove constructs, repairs, and updates custom garages and garage doors throughout the Chicago metro area. Contact us at 630-852-8485 to discuss how we can create your ideal garage solution.